Hari ini adalah hari Jumaat, penghulu hari. Esok umat Islam di Malaysia akan mula menjalani ibadah puasa bagi tahun ini. Seharusnya bulan Ramadhan al-Mubarak adalah bulan yang ditunggu-tunggu dan dinanti-nanti oleh semua umat Islam. Kerana ia merupakan satu bulan yang penuh keberkatan dan rahmat Allah. GiLoCatur amat menunggu-nunggu kehadiran bulan Ramadhan tahun ini. Tidak sabar rasanya untuk menjalani ibadah puasa, menunaikan solat tarawih, membaca Al-Quran dan pelbagai amalan lain. Semoga hati yang kotor dan berdaki dapat dibersihkan. Semoga ibadah puasa dapat disempurnakan dengan baik. Semoga solat tarawih tiada yang 'miss'. Semoga Al-Quran dapat dikhatamkan sekurang2nya sekali. Semoga rajin bersedekah di bulan yang mulia ini. GiLoCatur berhasrat untuk 'bercuti' membawa anak2 ke pertandingan catur di bulan Ramadhan. Anak2 pun tidak berminat untuk sertai sebarang kejohanan catur di bulan Ramadhan. Setakat ini, hanya kejohanan catur Swensen Age Group yang pernah disertai anak2 GiLoCatur. TETAPI mungkin di tahun ini ada sedikit perubahan. Swensen's Age Group akan diadakan dalam bulan Syawal iaitu seminggu selepas hari raya. Seingat GiLoCatur, ada tiga kejohanan catur yang telah dijadualkan dalam bulan Ramadhan nanti. Dua daripadanya adalah anjuran Insofar Chess Academy. Ahad ini iaitu pada 22hb Julai, Insofar menganjurkan kejohanan catur peringkat umur atau age group di Seksyen 9, Shah Alam. Empat kumpulan umur atau age group yang dipertandingkan adalah Bawah U7, U9, U12 dan U15. Ini merupakan satu peluang keemasan kepada para penduduk Shah Alam untuk mengisi masa hujung minggu anak2 mereka. Jika tiada aral, GiLoCatur juga akan hadir membawa anak bongsu, Fahim, ke bangunan AMPAC Shah Alam yang terletak berhampiran McDonalds Seksyen 9, Shah Alam. Selepas sertai kejohanan catur, bolehlah berbuka puasa bersama keluarga di sekitar Bandaraya Shah Alam. 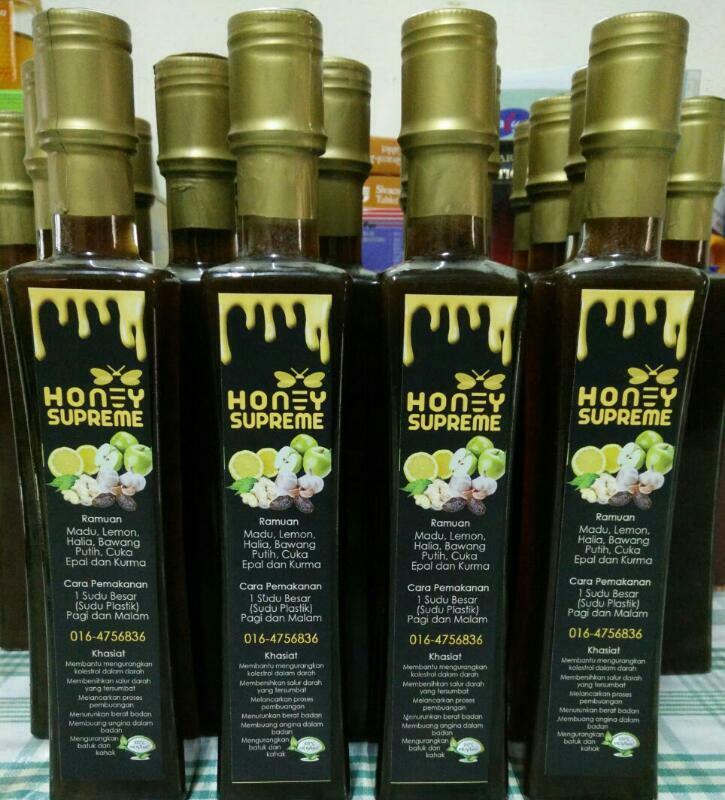 Sila klik di sini untuk maklumat lanjut. Di minggu berikutnya pula iaitu pada hari Ahad, 29hb Julai, kejohanan catur Insofar (combined) bagi bulan Julai akan diadakan di Pusat Catur Arthur Tan, Kompleks Wilayah. Pertandingan adalah terbuka dan mengikut flyernya, adalah national-rated. GiLoCatur tidak menyertai sebarang kejohanan catur national-rated dalam suku yang lepas. Hati amat meronta-ronta untuk bertanding dengan harapan untuk menaikkan rating kebangsaan. Nak tengok setakat mana improvement setelah sparring, main catur online dan buat puzzle. Bak kata rakan catur GiLoCatur, Fauzi Ahim "ADE BRANI?" Sila klik di sini untuk info lanjut. Dua minggu kemudian iaitu kira2 seminggu sebelum Eidul Fitri, satu kejohanan catur national-rated akan berlansung di ICT Seksyen 7, Shah Alam. Kejohanan catur tersebut diberi nama "Battle Chess Selangorku" anjuran Cerdik Catur. GiLoCatur amat berharap tiada aral mendatang untuk sertainya. Ia bakal menjadi satu pengalaman baru bermain catur di ICT. Tambahan pula, GiLoCatur dan keluarga boleh berbuka puasa bersama keluarga adik ipar yang tinggal berhampiran lokasi kejohanan. Klik di sini untuk info lanjut. Diharap rakan2 catur seperti 17ChessClub, geng Bilut dan geng Subang ADE BRANI menyahut cabaran. Akhir kalam, SELAMAT BERPUASA! SELAMAT BERBUKA! SELAMAT BERTARAWIH! kepada semua warga muslim terutamanya rakan2 catur SeMalaya. The two-day KaSUGI team chess championship had just concluded several hours ago. There are six champion trophies in the tournament with the biggest total prize fund of 41,500.00 Malaysian Ringgits. Both Under 12 and Under 17 teams were playing together in the Junior category. Undefined FC team won all its eight rounds. The Under 17 champion accumulated 29.5 out of the total 32 game points and full 16 match points. It is an amazing result because there is no single defeat for each of its four team members. The champion for Under 12 category went to The Young Minds. The team is ranked fourth in the overall final ranking. With 19.5 game points and 12 match points, the team had won five, drew two and lose one. The organizer had allocated four champion trophies in the Open section. The trophies are for Open, Best Malaysian, Best State and Best IPT. 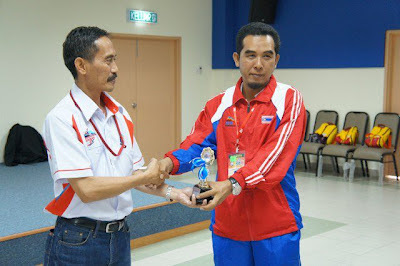 UTAR became the IPT champion. IPT is either private or public university. It scored 16 game points and 11 match points from five wins, one draw and two defeats. 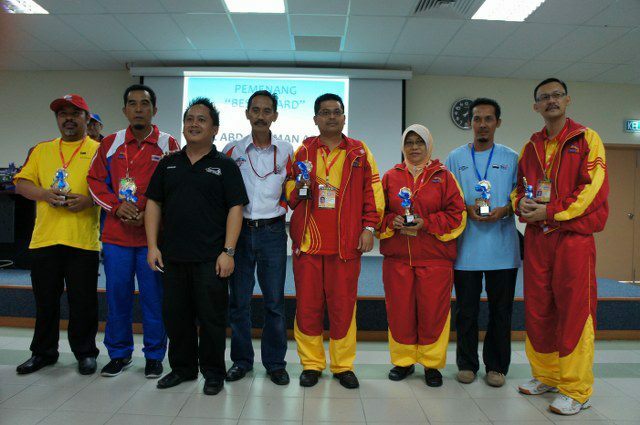 The champion for State category belongs to Penang A. The team who has a Fide Master and a National Master accumulated 20.5 game points and 11 match points. Tesla Chess which includes the Chan brothers - Dr Nicholas and Marcus, emerged as the champion for Best Malaysian team. In overall final ranking, it is placed fourth after scoring 21 game points and 12 match points from five wins and two draws. The Open champion had been won by a Filipno team named Apocalypse-Manila Chess Team. Led by IM Ronald Bancod, the all-Pinoy-players team wins 23 game points and 13 match points. As the Open champion, the team wins eight thousand Malaysian Ringgits money prize. The trophies and medals in this section was given by Puan Azlin Azhar. Congratulation to all the champions as per above pictures. The money prizes may be more in the next edition. GiLoCatur is, at this point of time, at Cititel Express Hotel. The hotel is located on TAR Street in the KL downtown. Why GiLoCatur is at the hotel? The answer is KaSUGI Chess Championship. 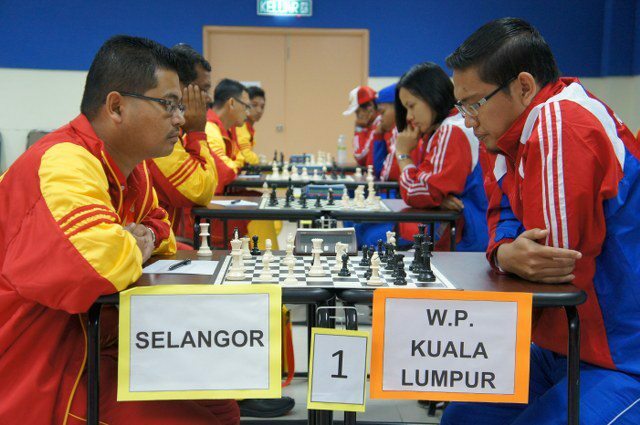 Yes, the Malaysian biggest team chess tournament is being held this weekend. Nearly four hundred chess players are gathering at the hotel's Mezzanine Floor particioating in either the open or the junior category. All the three children of GiLoCatur are also taking part. All of them are competing in the junior category. BUT they are not in the same team. Fikri, the eldest, plays second board for his Undefined FC team with three other his MSSMKL team mates - Faizal Roslan, Aziz Farhan and his elder brother Daniel Iskandar. Mean while, his younger sister Anis Fariha plays for her Kusess school team. Anis plays the third board. Her team mates include Irfan Haqqim Azhar, the reigning Malaysian woman national master Nur Najiha Azman and Noor Azam Mohd Noor. Fahim, GiLoCatur's youngest child plays with his SKBJ school team. Playing also third board like her elder sister, Fahim is joined by Faqih and Nur Faqihah Aminuddin. His other team mate is Raja Bazil Bot who is also a Year 4 pupil like him. 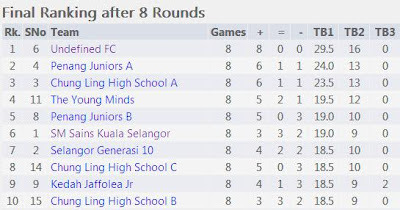 In the on-going third round, Fikri's team has moved to the top table after winning the first and second rounds with full 4 points. In the second round, Undefined FC thrashed Fahim's team of SKBJ. Mean while, Anis' team had lost their top ranking after just drawing their second round. How about the Open section? Getting to the third round, four teams left with 8 full game points. On the top board, Nameless which includes NM Zhou Ren is playing against the 14th seed, STMIK-STIE Mikroskil. Selangor B which consists of AM Fadzil Nayan, Syakir Shazmeer, Nabil and Syazwan is paired against a Filipino team at Table 2. 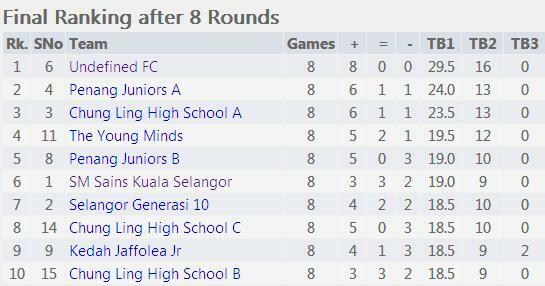 How both the all-Malaysian young men teams fare in the third round? Let's wait their results. RUSLAN is a common name in Russia or Ukraine. The most popular and highest rated chess player with such name should be Ruslan Ponomariov. With rating of 2726, he is ranked number 24th in the July Top 100 FIDE Ranking. He is one of the youngest chess player ever to earn a Grand Master (GM) title. In Malaysia, it is ROSLAN. 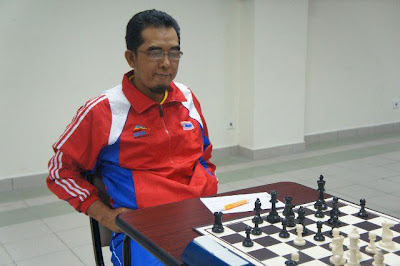 The only RUSLAN in Malaysian chess that GiLoCatur could think of is the father of Haslindah, the female MCF Vice President. There are two ROSLANs in the Malaysian chess community that are familiar to GiLoCatur. Who are they? 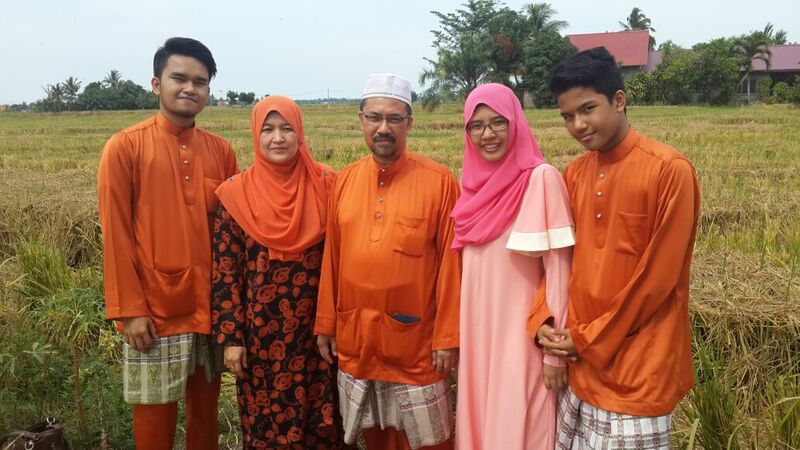 They are Roslan Sulaiman and Roslan Abd Aziz, the father of Mohd Faizal, a junior Malaysian chess player. The former Roslan has the same home town as GiLoCatur and is rated nationally at 1679. GiLoCatur had seen him competing in several chess tournaments. He even had participated in DATMO championship. Meanwhile, GiLoCatur had never seen the latter Roslan participating in a chess tournament. He just attended chess tournaments to support his son. GiLoCatur even doesn't know his chess rating. BUT few days ago both Roslans had playing in the same chess competition. It was held in Kota Kinabalu, Sabah. The name of the event is Sukan KKM ke 27 or the 27th edition of Malaysian Ministry of Health Sports. So, the photos of Roslan Abd Aziz playing in the "Sukan KKM" chess tournament is very exclusive to GiLoCatur and the Malaysian chess community. Roslan Sulaiman was representing the state of Wilayah Persekutuan KL while Roslan Abd Aziz was representing the state of Selangor. 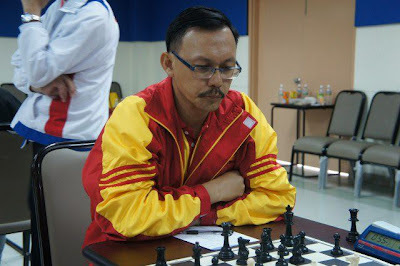 GiLoCatur does not have the full results or info about the chess event of the Sukan KKM, but based on the photo collection of Charles Lucas, one of the arbiters, both Roslans won their respective boards. 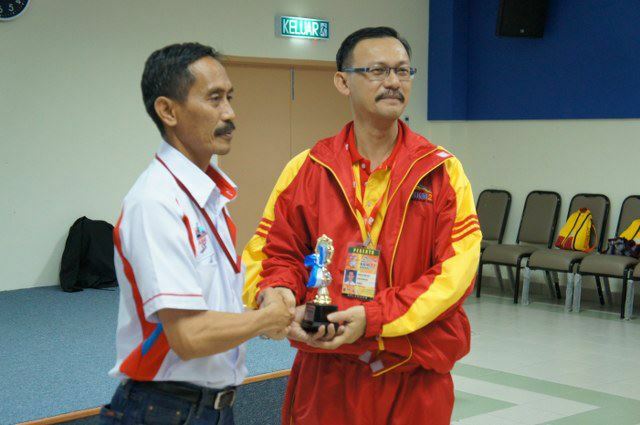 Roslan Abd Aziz must be very happy since his Selangor team came out as the champion of the event. The first runner up went to Sabah and the second runner up was son by Pahang. Both Roslans (2nd from left and 1st from right) won "Best Board"
GiLoCatur would like to congratulate both Roslans who are among GiLoCatur's chess friends and acquaintances. GiLoCatur would like to say THANK YOU to Charles Lucas for allowing GiLoCatur to use his photo collection in this entry. It is almost 1.30am in Shah Alam. GiLoCatur is still awake to watch the Euro 2012 Final between Spain and Italy. Actually, GiLoCatur did not watch live most of the games until the end. Often GiLoCatur went asleep before the games were over. Hopefully, GiLoCatur could manage to watch the final in about one hour until the referee blows the whistle at the end of the 90 minute. During the group stages, GiLoCatur was in Vietnam. So, GiLoCatur had to watch the games in Vietnamese. 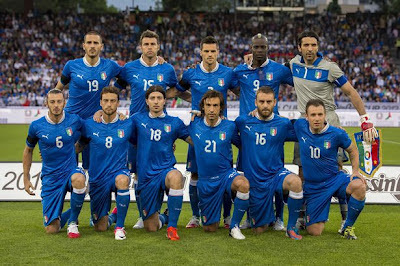 Euro 2012 will be remembered by GiLoCatur due to the fact. Watching most of the group stage games especially the matches that involve France, England, Germany, Portugal, Italy and Holland alone in Room 201 of the Holiday Diamond Hotel. What is or are GiLoCatur's favourite teams during world cup or euro? GiLoCatur has been a fan of Les Blues and The Oranje. GiLoCatur also follows closely the Three Lions. Unfortunately, none of these three teams had gone through the final. So, which team in the final today that GiLoCatur will cheer? In the Malaysian chess community, the final match today between Spain and Italy is referred to The Spanish Game or Ruy Lopez versus The Italian Game or Giuoco Piano. Neither of such two chess openings that GiLoCatur uses while playing chess. Queen Gambit is GiLoCatur's chess opening for white and French Defense for black. Even GiLoCatur is more familiar with Ruy Lopez, for the Euro 2012 Final GiLoCatur chooses Giuoco Piano. It means GiLoCatur will cheer for the Azzurri this early morning. 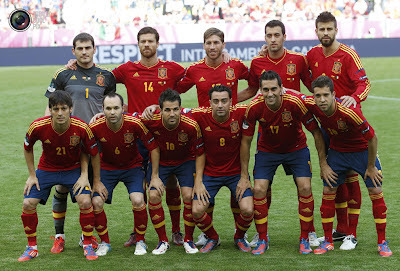 They are the underdogs compared to the La Roja team that is the hot favourite. What is GiLoCatur's dream Euro 2012 final? 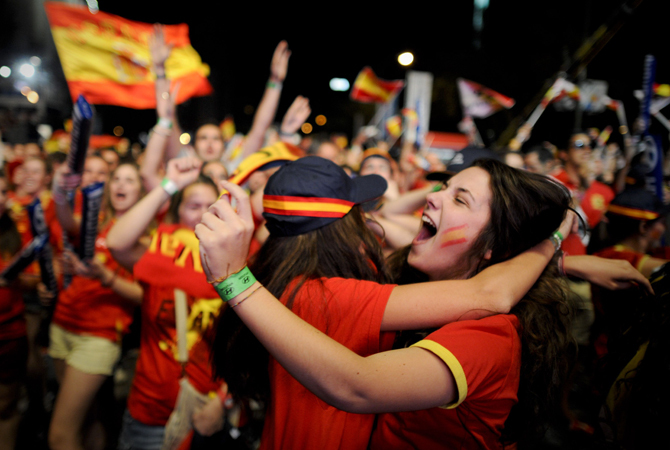 During the semi final matches, GiLoCatur picked Portugal and Germany to go through. For GiLoCatur, both teams showed entertaining football. In Portugal, GiLoCatur loves to watch its speedy and skillful wingers - Ronaldo and Nani, run their opposition teams havoc especially during the counter attacks. In Germany, the brilliant "Team" attack really amazes GiLoCatur. What time control it would be? 90 minutes or 120 minutes? Will the Ruy Lopez fans including NWM of http://setiachess.blogspot.com/ and Sky Syaz will be jolly and happy like in the following picture ?? ?